AudioControl DM810 allows users to truly optimize the performance of their audio system, regardless of whether they are using a factory or aftermarket source, and to truly achieve the goal of “Making Good Sound Great”. 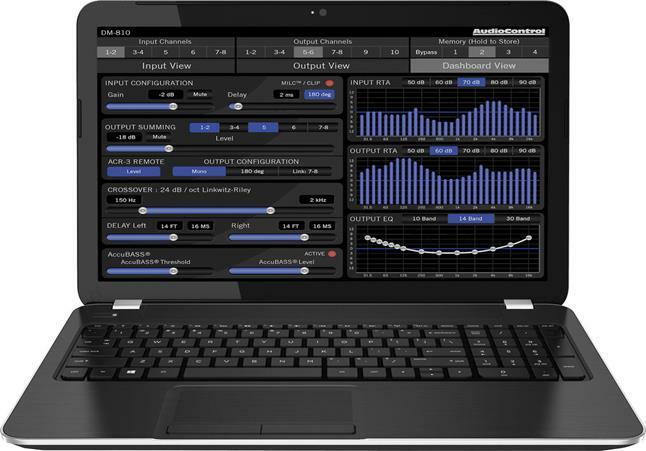 AudioControl designed their DM-810 digital signal processor to integrate into just about any car stereo system, to correct factory sound processing, and to deliver customized, high-fidelity audio to your aftermarket amps, speakers, and subs. You make adjustments and save settings via your laptop (PC or Mac). The Smart-User DSP software package includes Linkwitz-Riley crossovers, 30-band graphic equalizers, parametric filters, time delay/alignment for inputs and outputs, phase correction, AccuBass™ bass correction, and real-time analyzers (RTA) for the inputs and outputs so you can visually confirm the improvements in the sound. The DM-810 is "matrix-able," giving you the ability to combine and route any input to any output. So, if your car's factory system has separate pre-filtered, time-aligned, or amplified signals going to factory subs, woofers, mids, and tweeters, for instance, the DM-810 can combine them into one smooth, unified signal for you to balance, align, and tune for your better-sounding aftermarket speakers. Onboard LEDs indicate optimized signal flow for inputs and outputs, plus give you a warning when a source is too loud and causing distorting. An optional ACR-3 wired remote controller lets you select sources, control levels, and recall up to four preset tunings from your front seat. An optional Bluetooth® adapter lets you stream music and control the digital processing wirelessly from your compatible portable device. 2017 In-Vehicle Audio-Video "The Best of Innovation Award" Winner!